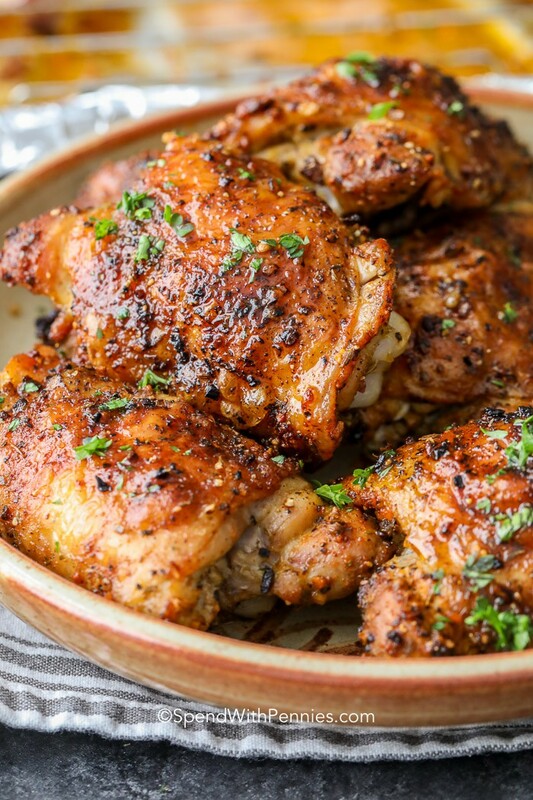 Baked Chicken Thighs are a delicious and very simple main dish. 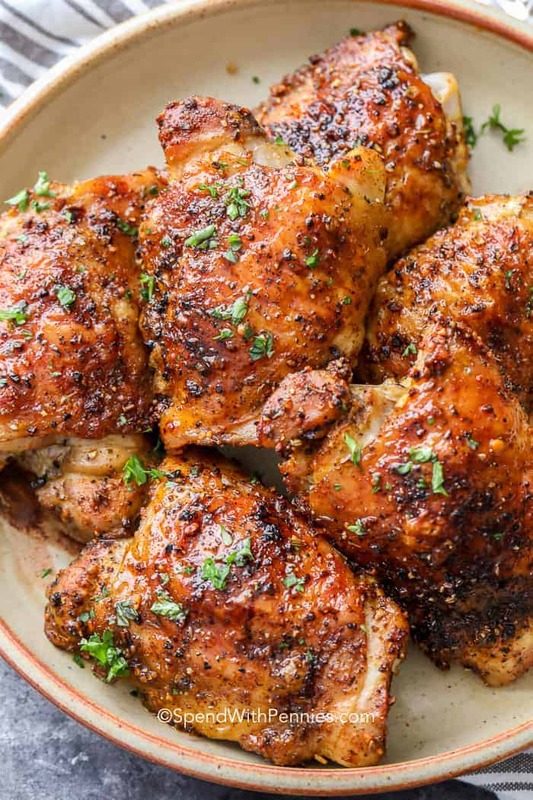 Chicken thighs have so much flavor and of course dark meat is so incredibly tender! They are perfect served alongside mashed potatoes or Scalloped Potatoes. Cook up a large batch to feed a hungry crowd, add to your favorite Homemade Chicken Noodle Soup or freeze the leftovers for another meal. 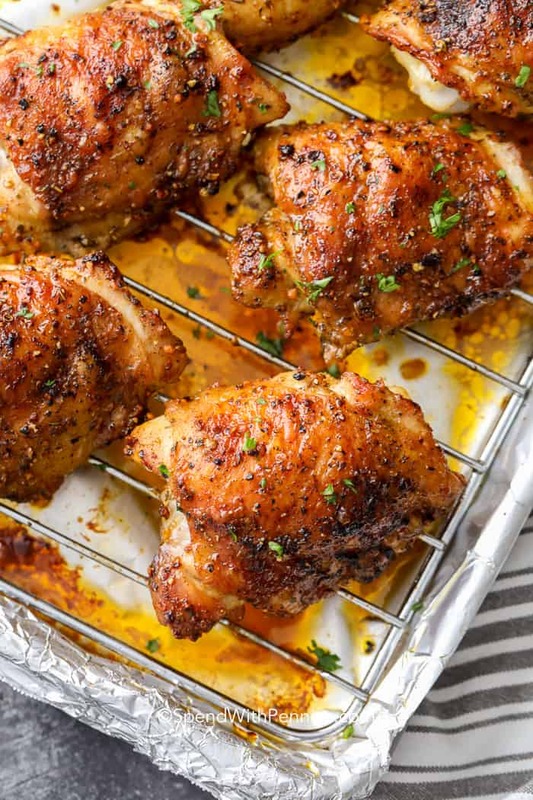 Oven baked chicken thighs can stay frozen for up to four months. Just thaw and then wrap in foil for reheating. Chicken thighs are sold with bone in and skin on, or boneless and skinless. They are dark meat making them extra flavorful, they contain more fat which ensures they bake up succulent and tasty. Thighs are more forgiving than Chicken Breasts which can more easily be overcooked. In this recipe, I choose skin on (because it tastes amazing and makes the chicken extremely juicy). As with any meat cooked on the bone, this has tons of flavor. I love using chicken seasoning or Italian seasoning in this recipe, but feel free to change it up to suit your taste buds! For chicken seasoning I either create my own mixture (like the one I sprinkle on my Roast Chicken) or purchase a favorite chicken rub mixture. 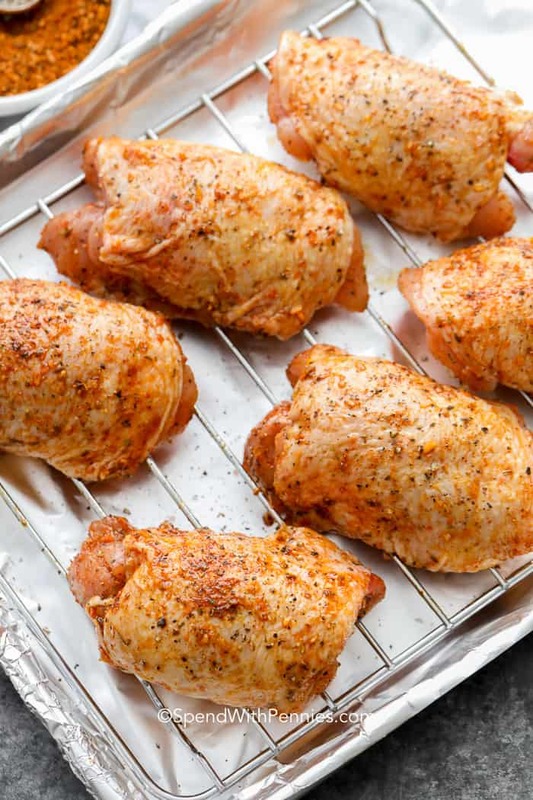 For the juiciest oven baked chicken thighs, choose bone in and skin on. The skin crisps up nicely, and the bone imparts more flavor while keeping the meat moist. A high temperature helps crisp the skin (my favorite part). Pat each thigh dry with paper towels. 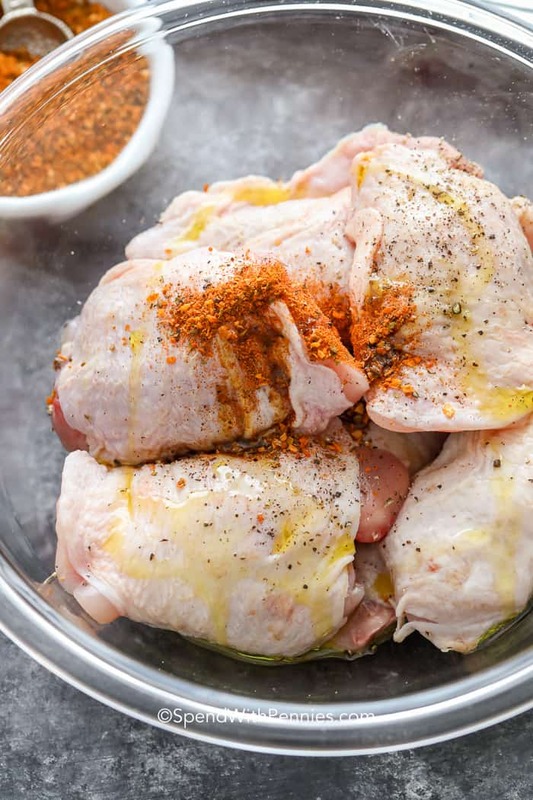 Place the chicken thighs in a bowl and toss with olive oil and a generous amount of seasonings. Line a pan with foil and add a rack. Place chicken (skin side up) on the rack. Bake until chicken reaches 165°F. Baked bone in chicken thighs require about 35 minutes baking time at a high temperature. Bake them until the juices run clear, and there is no more pink at the bone. Keep in mind that boneless skinless chicken thighs will require about 10 minutes less time. Chicken thighs may vary in size so it’s a good idea to use a meat thermometer any time you are cooking poultry. The safe cooking temperature for chicken is 165°F. How to Make Poached Chicken – great for shredding or salads! 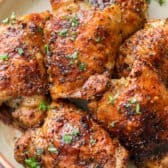 Baked chicken thighs make a delicious and simple main dish. The thighs have so much tender dark meat flavor! Preheat oven to 425°F. Line a pan with foil and place a baking rack on top. Dab chicken skin dry with a paper towel to remove any moisture. Drizzle chicken with olive oil and season with seasoning, salt and pepper. Place on the rack and bake 35-40 minutes or until chicken reaches 165°F. Broil 2-3 minutes to crisp if needed.